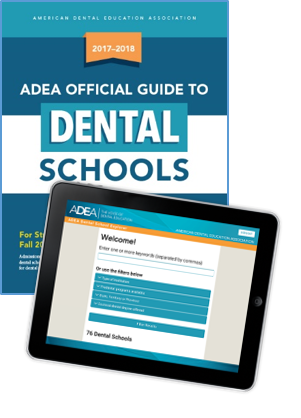 Buy both the 2019–2020 ADEA Official Guide to Dental Schools (printed edition) and the ADEA Dental School Explorer online tool and save! In addition to profiles of 76 U.S. and Canadian dental schools, the 2019–2020 Guide provides a wealth of information designed to help you navigate the dental school application process; learn more about the importance of access, diversity and inclusion; understand the holistic (whole file) admissions process; consider your options as a gap-year student, career changer or re-applicant; and finance a dental education. You’ll also receive a one-year subscription to the new ADEA Dental School Explorer. This online tool contains the profiles the 76 U.S. and Canadian dental schools featured in the printed edition—all searchable by key word and filterable by institution type, predental program, and location (state, territory or province). Note: Additional shipping charges will apply for the print edition. Cost: $50 plus shipping for the printed book. All sales are final. No refunds will be issued.